Every bride will feel differently about what they consider to be a cheap bridesmaid dress—we all have different financial situations, and one woman's affordable might be another's major stretch. But one thing I have learnt over the years is that no bridesmaid or bride ever seems that keen on spending a great deal of money on the dresses that aren't the main bridal event: Fair enough. I didn't even have bridesmaids at my wedding, so I can't profess to be a total expert in this field. However, I am pretty well versed in the high street and what looks good on it. 1. Satin is a popular fabric again, and no one can tell whether you've got a luxe, expensive version or not. So here's a great trend-ticking, rich-looking option to gravitate towards. 2. As a whole, top-quality printed dresses can be harder to pick up on a budget, and patterns can date easily. So, unless you're looking at a fairly classic floral, I'd recommend landing on a block colour. 3. Many of the dresses below come in different hues, sizes and cuts. So, if you like the look of something but it's not 100% right, I'd urge you to click and explore further. 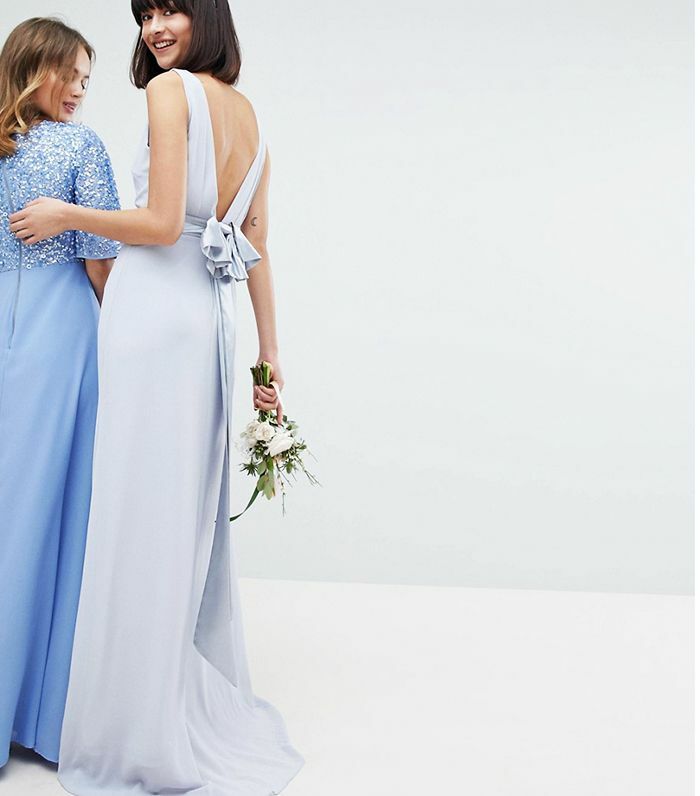 ASOS's bridesmaid dress collection is perhaps the most thorough, and you will find tall, petite, curve and more in any given style. 4. Simpler is better. You can always add interest with accessories and bouquets, but in general, all bridesmaids seem to appreciate having a versatile frock they can wear again. If I'm completely honest, a more pared-back style will also ensure you feel like the centre of attention. 5. It's hard to get a lot under £50, so I upped the budget here to £70 and below. Some great options do fall way under this mark, but it's a limited edit of top-notch options. So go forth and shop from the chicest cheap bridesmaid dresses below. Not all brides want their crew in midis and maxis, right? This shade of emerald green should look good on all skin tones. A beautiful choice for updos and shorter haircuts. Such a popular bridesmaid dress colour. I think this style could benefit from the addition of a belt—but the colour is so wow. This would be ideal for a more bohemian wedding. Yes, this will pop in your photos—in a good way. For the women who prefer minimalism. It's the bow shoulders that really sell this dress. Go down the '90s route and wear with hair clips. A true winner your girls will wear again and again. At the end of the day, chat with your wedding party to determine what everyone would be most comfortable with—and maybe take these trends under advisement.